When you read that something is this simple, you tend to question. Really? Just three ingredients? How good can they be? Plus you don't have to have a lot of ingredients on hand (or expensive ingredients on hand) and they only take a few minutes. 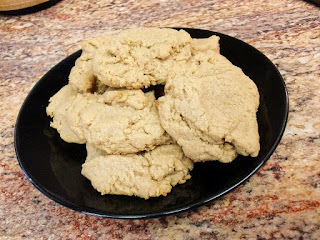 I had read several recipes around the Internet about 3-ingredient peanut butter cookies, but people kept adding other ingredients. Some wanted vanilla or chocolate chips or ... other things that makes them not 3-ingredient cookies anymore. So here's the "this actually makes sense" version of 3-ingredient peanut butter cookies. 2. Combine the three ingredients in a bowl. Let's usher in spring with a giveaway! This lovely prayer journal is handmade around a 5x8 inch, 50-sheet yellow notepad. And it's layered with the most vibrant spring colors and patterns. All you have to do is email me at victoriouschristianwoman@gmail.com. Leave your name and explain how you would use this prayer journal in your daily walk with the Lord. ﻿ One winner will be chosen at random, and I will post their name and response here next Tuesday. You have until Saturday night at midnight (Central Time) to write me. I look forward to hearing about what your prayer life truly means to you. Have a wonderful week in the Lord! And good luck! It's been one of those weeks - filled with lessons I didn't even know I needed to learn. Isn't it interesting how God works? 1. God can use any situation for His greater good. Even when we don't see the bigger picture, He does. 2. When you feel like you've been attacked, don't attack back. The Lord will always handle it Himself, in the very best way. 3. Soy milk doesn't work in recipes. Just use it on your cereal. 4. Be a testimony to God's glory, especially when you're in a difficult situation. 5. God first, family second and everything else after that. 6. A change in attitude can change everything. 7. Patience may be a virtue, but it's very possibly the most difficult one to cultivate. 8. The Lord answers every single prayer, we just have to accept the answer. 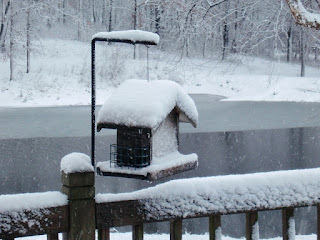 Even the birds won't venture out when the wind of a snow storm is howling. Isn't it easier to stay cozy in the nest instead of venturing out? It would be, but that's not how to weather the storm. We can't always stay protected indoors. There are times when we're called on to brave the wind and the snow and follow God's direction. We can't do that and stay bundled under the covers. Make this a weekend of weathering the storm. Turn to the Lord for shelter, provision and safety no matter what the weather may do around you. Why do you choose to do the things you do in life every day? Whether you keep the home, work in a secular job, raise a family, care just for yourself, volunteer or stay in the house, something is motivating you to do what you do. Is it pride ... or to be a blessing? Is it for the accolades ... or are you following God's direction? Is it so you'll feel good ... or is it to be a witness? Is it out of tradition or habit ... or is it to be a good steward of God's provision? I received an email recently from someone I barely know. 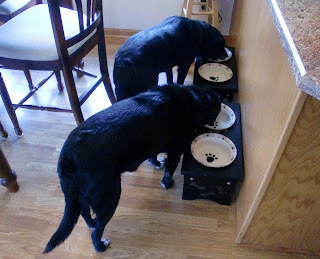 They have a role to play in a project I'm working on and their input is essential. Any knowledge and instruction from this person is precious to me because it means I can improve and succeed in the task at hand. This email, however, made me want to quit the project altogether and find quieter pastures. In just a couple of paragraphs, I was made to feel inept, inadequate and about two inches tall. After just one mistake and one oversight I was being written to (not even spoken to) in a tone I wouldn't use with anyone. I won't tell you that I cried because I didn't, but I was close. Anytime someone attacks you, it becomes personal. But the flesh wanted to react. I instantly wanted to write back and make this person feel even smaller than I did. The old nature wanted to tell everyone and get them behind me in a mob and send out a posse. My flesh wanted satisfaction and it wanted it now. It absolutely kills me to get rid of useful things. 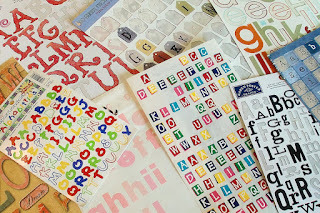 Take this huge pile of alphabet stickers, for example. They are in perfectly good condition, but I have used up many of the "important" letters. Now the colors don't match, there aren't enough to make recognizable words and I don't have the coordinating papers for many of them anymore. Here's where creativity comes in. 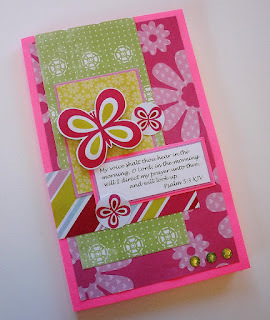 I used a variety of sizes, shapes and colors of leftover alphabet stickers to make the background for this card. They're all overlapping and jumbled together, so it doesn't matter that they're all different - a hodgepodge of surplus supplies. Then I used a few more to make the 'thanks' for the front and there you have it. It only made a slight dent in the thousands of letters that I have, but it made for a lovely card. I was standing in the check-out line of a local thrift shop this week, just like any normal day. Then two women started a very heated, very rude conversation. What should have been a simple statement and response turned into something very ugly and very uncomfortable for those of us within earshot - which was probably most of the county. And unfortunately, these women worked there. Yes, two employees were having a war of words right in front of at least a dozen customers. Not only was I uncomfortable, I was shocked that women would speak that way to each other to begin with, let alone in front of total strangers. God is very clear in His Word about what a woman's speech should sound like. Here is a short Bible study for you to meditate on - take one word and its Scripture to heart each day this week and imagine what the Lord can do with our mouths. What paths have you been traveling down this week? Make this a weekend of asking God for the old paths, the ones He created for the good way. And then ask Him for guidance to stay on them and follow where He would lead. Ah, the life of a puppy. Food is available and ready on schedule. One final post on the Valentine theme! 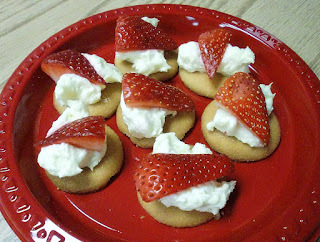 I just had to share this special treat with you that I made for family and co-workers Tuesday. This was actually not the idea I started out with. I had seen a beautiful picture of a strawberry turned upside down, split and filled with cheesecake filling. They looked yummy and so gorgeous lined up on a silver tray. I thought that would be just lovely to try. So, Plan B. I found a container of cut strawberries, some smaller than others, and they were the prettiest shade of red. I cut them into quarters and let them come to room temperature. There's nothing I hate more than cold, hard food. One of my favorite memories from childhood is my Easter morning egg hunts. I would wake up to find a note next to my bed telling me to go somewhere in the house. That spot would contain an Easter egg with either a goodie inside or another location to head to. At the end of a dozen or so eggs, I would find my Easter basket. This concept is one that has stuck with me for three decades. I use it all the time so that my husband doesn't just have a pile of gifts waiting for him. That's too easy. For his Valentine's Day gift yesterday, I had four little things I wanted to give him. But instead of investing in a gift bag, I made him a treasure hunt. The first note tells where to go first. That's where the first gift is hidden. It's always best to give a gift on the first note, just for the feeling of accomplishment. By the first gift is a second note, giving the next location. How long does it truly take before the stuff of the day takes over our lives? It seems like a brief time of busyness, some stress and a little worry, and then next thing you know we're on overload. This is not how God intended for our hours, days and weeks to go. 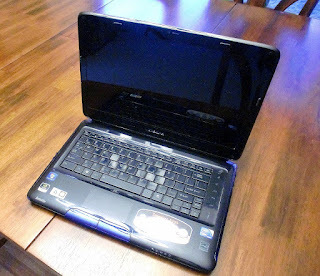 We're not like a computer that can just be replaced when there's a hardware or software malfunction. But some days we feel like something's got to give. Make this a weekend of rebooting your system. Draw closer to the Lord and allow His presence alone to restart you fresh, ready to go about His business. It's now less than one week until Valentine's Day. Use the next few days to plan the most lovely, heart-shaped meal for those you love. From beginning to end, there are so many ways to make lovey-dovey food! Grab a heart-shaped cookie cutter, heart-shaped pans and a knife - the possibilities are endless. This little bird is the silliest thing to watch. During the morning hours, he can't see through this window. But it's big and clear and shiny, so he thinks it's something eh can fly through. 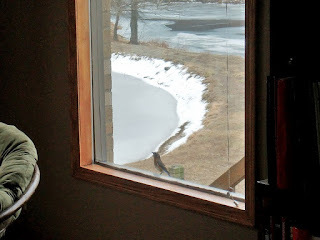 He'll spend the better part of an hour flying into the window, flapping his wings against the glass over and over again. He's not going to break through, but he can't seem to understand that. Some days I feel exactly like this little bird. I can't see exactly where I'm going because I'm so tired and sore. I've probably wasted too much time flapping my wings against the window of life, not understanding that I can't break through the world. Hearing the bird flapping against the window makes me realize how unproductive I can be in my own ways. I may strive to be something in the eyes of the world or something more than I truly am, and that's just flying into the glass over and over again with no success. 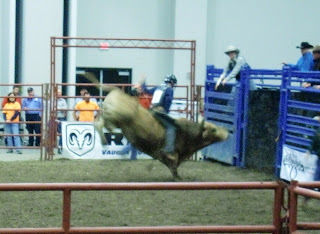 A bull rider has to hold on to the bull rope for 8 seconds in order to receive points. He can't win if he doesn't determine to hold on for the entire ride. Make this a weekend of having a bull-rider mentality. Determine that you'll hold on for the full 8 seconds this weekend. It's easy to give up or make compromises in your Christian walk - it's difficult to persevere through all the trials. But Paul says through Christ we have the strength to run, obtain and succeed. 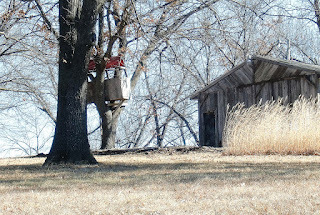 OK, so that's not how the song goes, but that's the scene on our property these days. We've seen deer just about every day over the winter, including a very handsome 10-point buck. 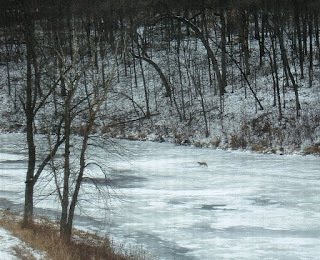 And just this past week we were shocked to see what we're pretty sure is a coyote walking across the big pond. We had heard them talking to each other in the night, but this was the first time we'd seen them during the day. We learned that January and February are the coyote's mating season, so being out and about it a little more frequent. But it also means we can't let the dogs out off-leash by themselves. There are some days when you need a quick, easy, filling meal. Time is short but you still need to eat well. That's when this steak stir fry will fit in perfectly. Using frozen stir fry veggies (I love the broccoli mix from our local grocery store) and pre-cut meat (again, thanks to our local meat counter), this dish comes together in a snap. Within 20 minutes you'll be eating a complete meal. 1. Heat 1-2 Tbsp oil in large skillet. Warm veggies as the bag instructs. 2. In a separate pan, brown the steak. When both are finished, combine in the larger skillet with 1-2 Tbsp soy sauce. Stir together until warm and combined. 3. Serve with your favorite combination of nuts and fruits for a healthy mixture.